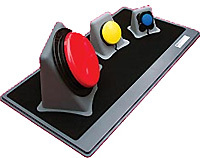 Digital joysticks are basically an array of on/off switches (normally four plus any buttons) making them ideal to connect to the A-PAC board. 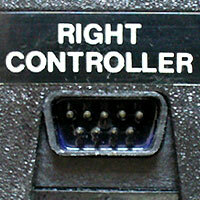 These controllers often suit people who can manage broad up, down, left, right movement but not precise motion. 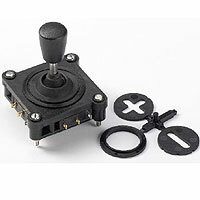 Smart use of the PC utility JoyToKey can allow users to alter how the joystick functions on the press of a switch. Mouse emulation with speed adjustment is possible. 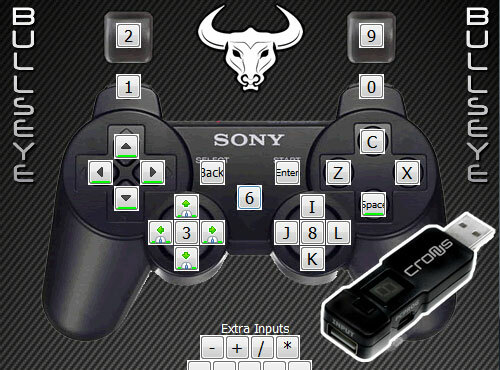 By adding a Cronus USB Device you can make Xbox 360 and Playstation 3 consoles easier to use too. 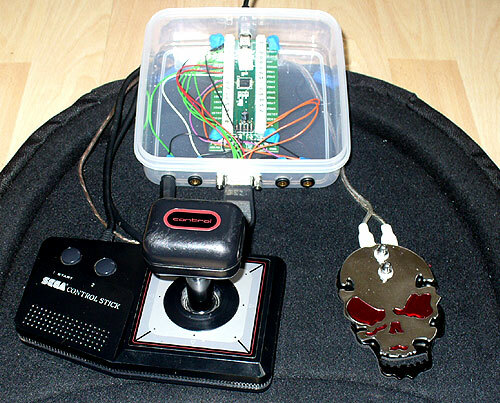 A basic joystick (or joysticks) can be wired up as pictured below using any available screw-terminals. You may wish to avoid the special 1STRT terminal which acts as a shift feature. 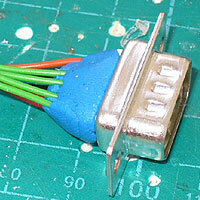 You can use SUGRU to keep wires in place on new microswitches if you want to avoid using a soldering iron. 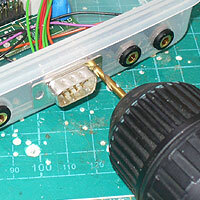 Adding a joystick socket: A nicer method is to add a joystick socket (or sockets) to your interface box. 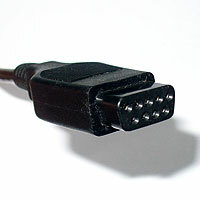 The method detailed below adopts the Atari VCS joystick standard (shared with Commodore Vic 20 to Amiga, MSX, Amstrad and other computers) which opens up a wide range of highly affordable sticks. Additionally, this method is shared with Environmental Control Unit compatible wheelchair joysticks such as MERU's Moozi and Komodo Open Lab's 4-way Joystick. Most of the basic components used here are commonly available from Electronics stores such as Maplin Electronics and Farnell. 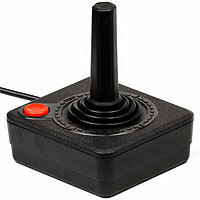 Atari standard joysticks can be found easily on eBay. Moozi joysticks are available from MERU. 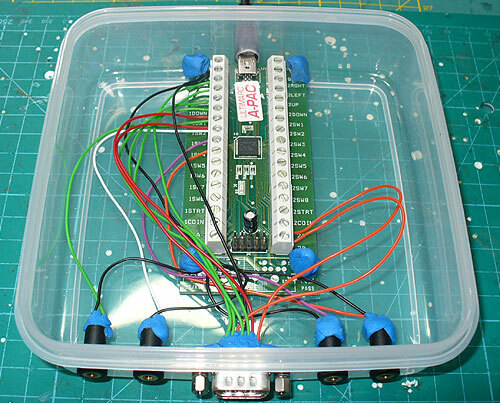 The DIY Assistive Technology Lunch Box starter guide explains how to build the basic interface box needed. 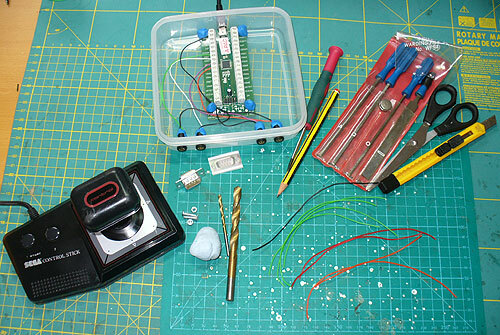 Overview of the parts needed (clockwise from top): AT Lunch Box, Screw-driver, Craft tools, Wire, Drill bits, Blue-tack, D9 Sub connector with paper-template and SEGA Joystick. 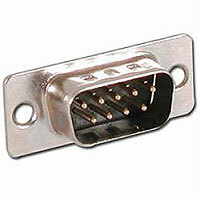 1x D-Sub 9-pin Male Solder Socket - (e.g. Maplin code "RK60Q") or similar alternative. Add or reduce sockets as needed. 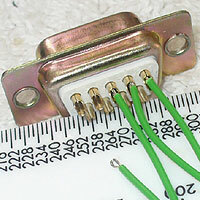 1.5m of 10 strand / 0.1mm wire, cut into 9x 15cm lengths. For ease of recongnition try to obtain at least two different colours. 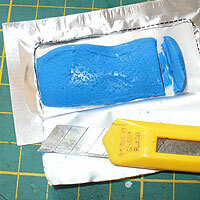 1x Sugru 5g pouch (or use a soldering iron and solder). 2x M3 nuts and bolts. 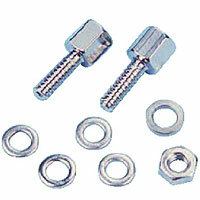 Specify "slotted pan head" style bolts if you wish to use with a small flat screw-driver. 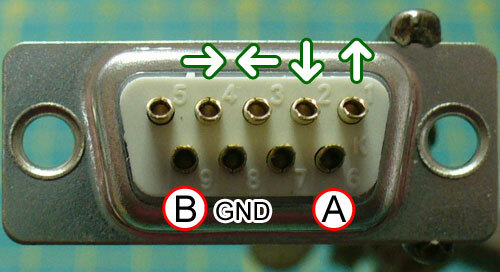 Alternatively, consider a pair of D-sub Jack Posts (Maplin code "FP31J" as pictured left) which allows you to bolt on some some custom joysticks. Tools: Cordless drill with 3mm and 9mm drill bits, small file set, small flat-headed screwdriver, pencil, scissors, craft knife and Blu-Tack. A small pair of pliers would proove very useful too, especially for tightening the bolts and putting the wires into the A-PAC. 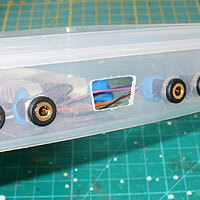 Cut your joystick port template out and then blue-tack it inside your sandwich box as pictured. This simply helps you to line up your socket neatly. Carefully draw or scribe around the D shape of the socket then remove the paper. Drill some 3mm holes inside the D shape you have made. 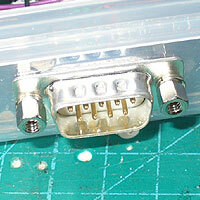 Patiently file away to leave a D shape (as pictured) that you can fit your D-sub socket into from the front. Tidy with a file and/or knife. 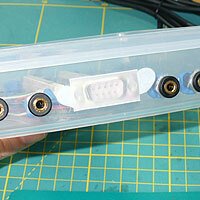 Adjust this method to take into account fitting extra joystick ports or if using a different style of enclosure/box. Expose the wire and bend it over as pictured top right, to make it fit more securely. 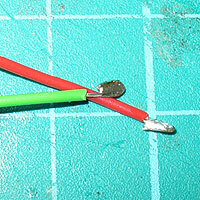 Carefully apply SUGRU to keep the wires into place. 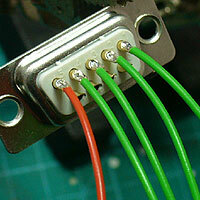 If you have the tools and moderate skill needed, soldering is a much quicker method. It holds immediately and allows you to make a visual check to ensure that everything is in place correctly and cleanly. View above of the solder side of the joystick port. 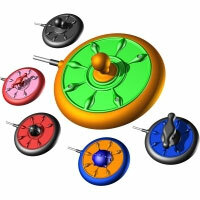 Pins 5 and 7 are typically used in some analogue controllers or could be used to add extra buttons to a joystick. If confident that your SUGRU is holding everything in place correctly (consider an early test as below), allow 24 hours for the SUGRU to set hard. Next expose the trailing ends of each wire, and bend them carefully in half to give a bigger surface area for the screws to grab onto. If you can, putting a blob of solder on the ends will make them stronger. Fit your D9-sub socket into the hole you made at the front of your AT Lunch Box and then drill two 3mm fixing holes as pictured. Insert your M3 nuts and bolts or (as pictured) D-sub Jack posts. Screw your wires into the A-PAC. I recommend your first joystick follows the method as above and below. This means that the SEGA Control Stick A and B buttons are also accessible via switch sockets 1 and 2 on the front panel of the AT Lunch Box. As before with switches, set-up JoyToKey to test that the new controls you have added are working correctly. Any problems, inspect your wiring, that the USB cable is secure at the back, and that you have followed the guidance as above. 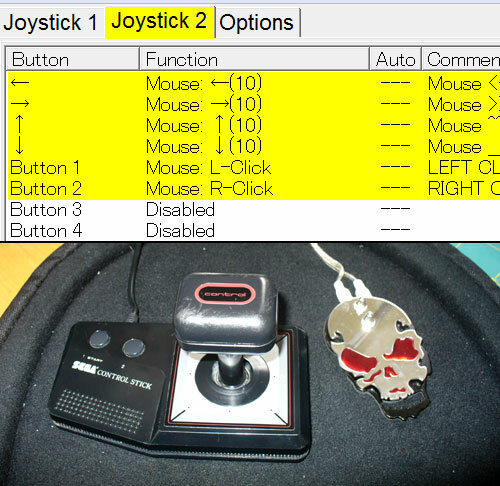 Click on the JoyToKey window to give it focus, then double click on each control to assign a function. Mention Trabasack and Maxess plus home made clamps etc. 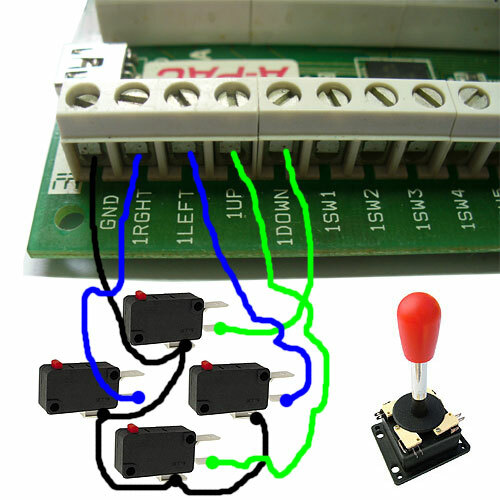 To create your own custom joystick that will work with this joystick port standard, you will need to blah blah blah , there is a huge range around the web from the likes of Arcade World UK, Suzo Happ and Farnell (search on "Microswitch Joystick" or "APEM 100113" for the one pictured left with limiter plates). 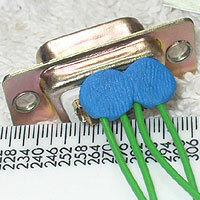 Try also the likes of Sparkfun.com (searching on "5-way Tactile Switch") and again eBay. For most of these non-Atari standard joysticks, you will need to either directly wire them to the A-PAC or add a female plug.